Congratulations to Jennifer Allan, Glenbervie and Stirling & Clackmannan, on winning the 2014 East of Scotland Girls' Order of Merit. 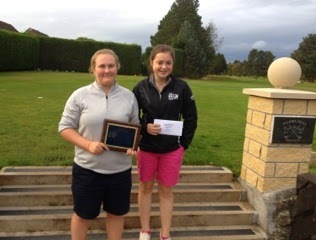 Emma Morrison, Craigmillar Park & Midlothian, is runner-up with Catherine Goodwin, Glenbervie, and Charlotte Munro, Gullane Ladies, taking third and fourth places. Congratulations to all the Prizewinners and well done to all the girls who played in the competitions this year and gained points. To view final placing and details of points gained, click Order of Merit to the left of this page. Thank you to Margaret Tough, Captain of Stirling & Clackmannan, who presented the Trophy and prizes at the East of Scotland Ladies Championship at Falkirk Tryst.